Two of the smallest depots in Scotland - Girvan and Jedburgh - closed during the summer. They join other small depots that no longer exist, such as Newburgh (Fife), Pitlochry (Midland) and Nairn (Highland). Below is a sample of some of Scotland's smallest depots. The long hot summer of 1976 - even in Scotland. Northern Alexander/Fords NT18/19 (SRS518/19K) at Buckie depot in July of that year. Buckie still has a depot, but on a new site. Jedburgh depot closed due to losing its routes following tendering. Eastern Scottish ZC465L (BFS465L), an Alexander/Bedford, is seen in Edinburgh returning to base in October 1976. Highland owned many small depots by the nature of its geography. 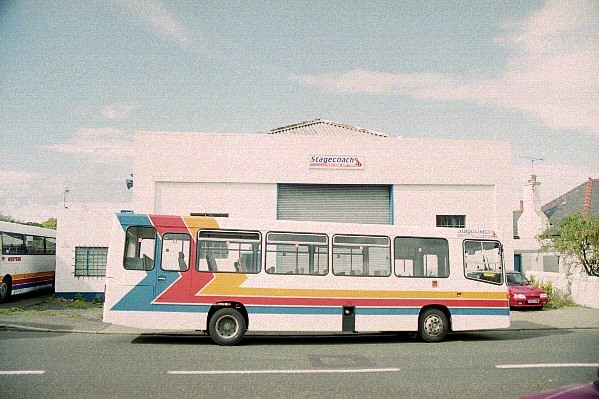 Their D928 (SMS128P), a well travelled Alexander/Fleetline, is seen at Tain depot in July 1990. There is still a depot in Tain. Girvan was strictly a sub-depot of Ayr, but had its own allocation of ten vehicles. A Stagecoach Western Scottish Dart is seen on the last week of operation in August 2000.